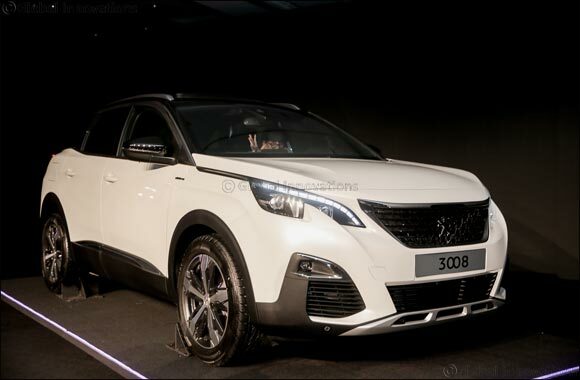 Dubai, UAE, May 8, 2017: The all-new PEUGEOT 3008 CUV was unveiled last Wednesday during a regional launch event at Jumeirah Beach Hotel, Dubai. The high-profile event was attended by Jean-Philippe Imparato, Chief Executive Officer of Peugeot brand, Jean-Christophe Quemard, Executive Vice-President Africa-Middle East of PSA Group, Cedric Zayoun, Managing Director of the GCC region at PSA Group and UAE’s celebrated rally driver Sheikh Khalid Al Qassimi, in addition to over 100 key figures from the industry and prominent media outlets from the UAE and the region. Under the theme “Stop imagining the future; Drive it”, the event featured futuristic multi-sensorial stations, where the attendees got the chance to discover the vehicle with a unique and immersive virtual reality experience. Making its debut through a remarkable show, the European Car of The Year 2017 features a spectacular, advanced dashboard. This coherent and highly technological ensemble is the latest generation PEUGEOT i-Cockpit®, a novel concept that has rewritten the book on the car cockpit. The large 8” touch-screen resembles a tablet installed in the centre of the dashboard and is equipped with capacitive technology for greater reactivity and practicality. It is accompanied by six elegant piano-key “toggle switches” - giving direct and permanent access to the main control functions: radio, climate control, navigation, vehicle parameters, telephone and mobile applications. Residents of the GCC will soon be able to experience the long-awaited vehicle that has been hot-weather tested in the region. With an engine range that is both powerful and parsimonious, the PEUGEOT 3008 CUV features a 1.6L Turbo, 165hp engine and 6-speed automatic gearbox that give ultra-low consumption with a torque of 240N.m at 1400 rpm. The car of the year 2017 also meets the need to stay connected at the wheel and to be able to navigate calmly and peacefully, reflecting the latest technologies of Peugeot like Mirror Screen, wireless smartphone charging and 3D connected navigation. During the launch, PEUGEOT CEO also welcomed Sheikh Khalid Al Qassimi on stage and commended his remarkable win of the Abu Dhabi Desert Challenge marking the very first victory of a private PEUGEOT 3008 DKR in a rally. Al Qassimi, then, was named PEUGEOT’s official driver in recognition of his outstanding commitment to represent the brand at its best.